Do you guys remember the first day of LOVE MYSELF campaign, November 1, 2017? Thanks to your enthusiastic support and participation, LOVE MYSELF campaign is celebrating its first year anniversary. To return the love, BTS, Big Hit Entertainment and UNICEF KOREA prepared a special event for everyone who participated in the campaign over the past year. The first surprise was a video message by BTS. In the video, BTS members thanked ARMY for spreading the message of LOVE MYSELF campaign all over the world. The members also shared how they felt celebrating the first anniversary, reminiscing from the start of the campaign to the recent UN General Assembly speech. Be sure to check out the full video where BTS members express their sincere gratitude for ARMY! The day of the LOVE MYSELF first year anniversary! UNICEF KOREA opened a very special event zone at Star Plaza, Sinchon Yonsei-ro from November 1(Thurs.) to 4(Sun.). 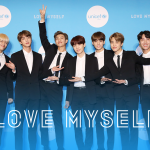 This was set up to spread the message of the LOVE MYSELF campaign, “love yourself and make a better world with that love.” At LOVE MYSELF 1st Anniversary Festa, visitors could experience various activities, learn about UNICEF’s #ENDViolence campaign and support it. The first thing visitors could see entering LOVE MYSELF Campaign 1st Anniversary Festa zone was a photo wall where you could take photos with BTS. Lots of people enjoyed taking pictures, holding various LOVE MYSELF campaign signs. Thanks to ARMY for sharing those photos on social media with #BTSLoveMyself. This added more meaning to the Festa and helped spread the words. Thank you again for always supporting us ARMY! After the photo shoots, visitors had the chance to listen to friendly UNICEF KOREA campaigners speak about the LOVE MYSELF campaign and UNICEF’s #ENDViolence campaign. They could also experience various relief supplies used to save children around the world. MUAC(mid-upper-arm circumference) tapes, used to determine malnourishment severity, supplementary food, water purifier and other items were displayed. It was a chilly day, but the atmosphere at Star Plaza was warm indeed filled with attentive visitors learning about the campaign. MYSELF campaign? Visitors could meet the airships via henna. Along with the henna experience, LOVE MYSELF pamphlet and paper signs with the campaign slogan(#BTSLoveMyself) were handed out. Many ARMY really enjoyed them as they were like “symbols” of campaign participation. For all those who paid a visit during the four days of LOVE MYSELF 1st Anniversary Festa, thank you so much! Thank you for supporting us over the past year, and please continue to remember “the true love comes from loving myself”. Do you guys remember the first day of LOVE MYSELF cam..